F&S Consulting and People in Need (PIN), one of the biggest non-profit organizations in Central Europe, signed a contract for a Market Systems Development capacity building process for its project and HQ staff and staff from other Czech development organizations. The support forms part of a capacity building project for Czech development actors funded by the Czech Development Agency. PIN was looking for an expert training and support consultancy that can help their staff to obtain a much better understanding what MSD means and how it can contribute to more sustainable results for its projects overseas. It was agreed that this collaboration would combine a 3 days training and practical follow-up advice and support to the participants. The training took place from 11-13 September 2018 in Prague with almost 30 participants. It was a diverse audience, composed of PIN HQ and project staff – from different countries in Africa and Asia – , other Czech NGO staff and donor representatives. The attendance by the latter category of participants was very relevant as they play a critical role in the acceptance and application of MSD in the field. If they also understand the implications and benefits of MSD, then the results will be far greater. Some of the PIN participants had already acquired experiences with MSD, for most participants MSD was new. The training itself was very practical and hands-on in order to turn MSD theory into practice. It made ample use of 4 different cases that project staff had brought in and which were used throughout these 3 days. A key exercise at the beginning was the vision assignment, where all the participants discussed 6 challenging statements, which in essence illustrated the necessary mindset shift that participants need to undergo. 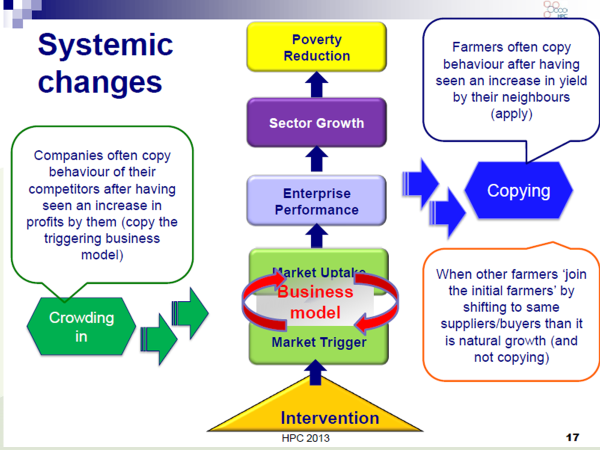 This exercise helped them understand the critical difference between conventional Value Chain Development and MSD. Another aspect is the facilitation role of staff in a MSD project, and the difference with the implementing role in a conventional (‘direct delivery’) project. For many project staff this role is something new that the staff needs to practice. Participants also learnt that direct training of farmers by the project is not the only option for knowledge transfer; other VC actors may be in a better position to conduct training and this will be more sustainable post project. Participants were introduced to a practical Cost-Benefit analysis. They realized that this is a critical step for farmers and other Value Chain actors before deciding to invest in improved production, equipment and inputs; whilst better analyzing and understanding the risks of such investments at the same time. Many participants liked the result chain which was a new tool for them, and the practical examples. F&S will continue to play its advisory role during this follow-up process. It will provide input on how best to apply MSD in practice and overcome challenges.